The recipe is a work in progress, which is why it’s not presented here in final form. 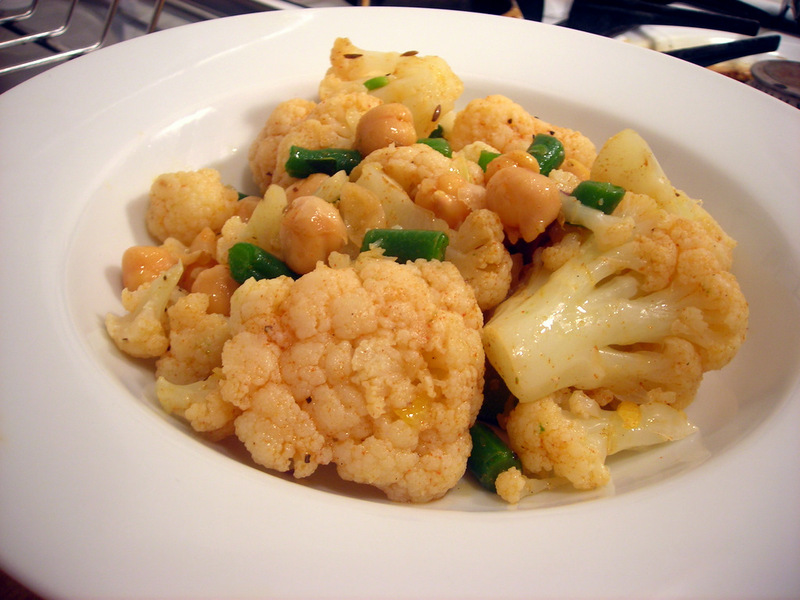 This version contains steamed cauliflower which was then coarsely chopped and tossed with: chopped steamed frozen green beans (you can substitute fresh), canned chickpeas (you can substitute dried, pre-soaked garbanzo beans), chopped and pitted oil-cured olives (you can omit or use other types of olives) and a vinaigrette consisting of cayenne pepper, toasted cumin seeds, salt, extra-virgin olive oil, fresh lemon juice and minced lemon zest. Combine vegetables and mix well. Spoon a couple of tablespoons vinaigrette over salad and toss. Spoon onto individual salad bowls and serve at once, passing remainder vinaigrette at the table. I’ve left out proportions intentionally so that people can come up with their own combinations. 07 Feb	This entry was published on February 7, 2012 at 11:59 pm. It’s filed under food, food photography, general, vegan, winter and tagged cauliflower, dinner, gluten-free, salad, side dish. Bookmark the permalink. Follow any comments here with the RSS feed for this post. That looks good and yet it’s so simple to prepare. Thanks for sharing! Interesting recipe. Cauliflower is on sale this week, so its time to experiment.